“And on the Sabbath day we went outside the gate to a riverside, where we were supposing that there would be a place of prayer; and we sat down and began speaking to the women who had assembled. A woman named Lydia, from the city of Thyatira, a seller of purple fabrics, a worshiper of God, was listening; and the Lord opened her heart to respond to the things spoken by Paul. And when she and her household had been baptized, she urged us, saying, ‘If you have judged me to be faithful to the Lord, come into my house and stay.’ And she prevailed upon us” (Acts 16:13-15, NASB). In Part I, I discussed the power of God’s Word to impute purpose. Here, as we continue the story in Acts 16, we will discover the power of God’s Word to build up others and empower them, breaking many intangible chains in the process. Paul and Silas arrive in the city of Philippi, which is in modern-day Greece. The duo springs into action and seek out “a place of prayer” where Jews in the city would presumably congregate. Here is where the text gets very interesting. When we, in 2016, read, “and we sat down and began speaking to the women who had assembled,” we casually brush over it as an incidental detail. Yet, for the audience who originally read (or heard) this passage thousands of years ago, this verse would have been an earth-shattering, cataclysmic revelation. This verse would have been as shocking as when Darth Vader told Luke Skywalker, “I am your father.” This verse would have been as shocking as when you found out that Bruce Willis was dead the entire time in The Sixth Sense. Why? Because in antiquity, Jewish men (Paul was a Jew, and Silas was half-Jewish) were not supposed to talk to unfamiliar women, and they certainly were not supposed to talk to strange women in public. (This is why Jesus reaching across the aisle and speaking to the Samaritan women at the well in John 4:7-38 is such a big deal). To do so was a blatant violation of the social rules of the day. In fact, in this time in the world, despite differences in language, culture, or nationality, a common stigma that was pervasive was that women were inferior, third-class citizens. Men, therefore, had “no business” conversing with women they were not affiliated with. Yes, this was a sad state of affairs, but that was the reality in which they lived. The power of God’s Word breaks the chains of social stigma. 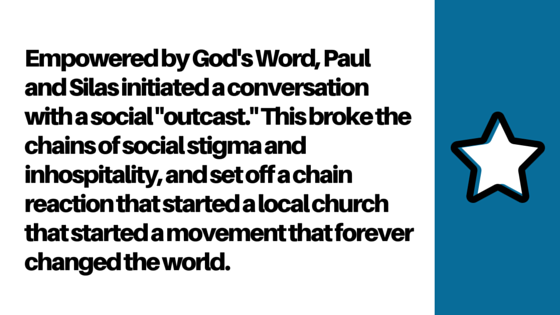 Paul and Silas were evangelizing to a marginalized, disenfranchised group—an act that was considered extreme radical behavior. They realized that when you embrace the power of God’s Word, it tells a story worth sharing, and those who are traditionally oppressed will appreciate the empowerment of the Word the most. Ironically, the church in the 21st century tends to be characterized by who it doesn’t associate with. In contrast, the “church” of two men back in the 1st century was characterized by evangelical radicalism and who it did associate with. Some men have since used the church to oppress, for example, women and people of color. As times change, so does the focus of the oppression, but the basic principle remains constant. Many fail to see the overriding theme woven into the fabric of time and sadly use God’s Word to enforce social stigmas instead of breaking them. The power of God’s Word breaks the chains of social stigmas because such stigmas are temporal and a creation of humankind. God’s Word is eternal and is revealed directly from the divine. The power of God’s Word breaks the chains of inhospitality. Lydia was a Roman. She was also rich, suggested by her trade and the reference to the household she lived in as “hers.” Roman society back then was very regimented based on class, so if you were rich, you didn’t fraternize with “commoners” who were “beneath you.” The lack of social mobility was a symptom of this dynamic. Hence, Paul and Silas weren’t supposed to be talking to Lydia. Lydia, in turn, wasn’t supposed to be talking to the “common” Paul and Silas. But after Lydia becomes empowered by the power of God’s Word and the chains of social stigmas are broken, Paul and Silas are no longer “unfamiliar” and “common” men. They have now become fellow brothers in Christ who engage with their sister in Christ. Lydia takes the bold leap from public conversation to private fellowship and thus invites them into her home in one of the ultimate expressions of Christian neighborliness: hospitality. And to demonstrate just how radical this was, the text says that Lydia “prevailed” upon Paul and Silas to stay with her. Prevailed comes from the Greek word parabiazomai, meaning to compel contrary to nature and right. Everything that the world taught Paul, Silas, and Lydia said that they were all incompatible. The world said that they come from different realms, and that each should stay within his or her own domain. But the power of the gospel breaks these artificial restraints and transforms incompatible strangers into hospitable neighbors. The power of God’s Word breaks the chain of inhospitality and compels all three people to realize—against their “nature”—that we all ought to treat others how we would like to be treated. Hospitality is the external expression of this internal belief. The power of God’s Word builds up others, who then go out and build up others. The remainder of Acts 16 tells a compelling story where Paul and Silas go through a lot. At the end of their tribulations, where do they end up? Back in Lydia’s house, which now serves as a welcoming, hospitable place for fellow believers. Acts 16:40 says that after Paul and Silas leave jail, they “entered the house of Lydia, and when they saw the brethren, they encouraged them and departed.” Remember that the city all of this is happening in is Philippi. It would be plausible to conclude that Lydia’s house served as the starting point for the Philippian church, an institution that Paul would later write that he adored and celebrated. Regardless, the simple point is that had Paul and Silas not been empowered by God’s Word, they would not have spoken with Lydia in the first place, and thus her house could not have subsequently served as a place for the encouragement of fellow believers. All these men did was take a little initiative across the aisle toward a group that everyone else would say is “unworthy.” This set off a chain reaction that not only built up others, but also demonstrated the empowerment imputed to all those who embrace God’s Word.